Ron Whitehurst sampling for whitefly parasites in Tecoma stans. 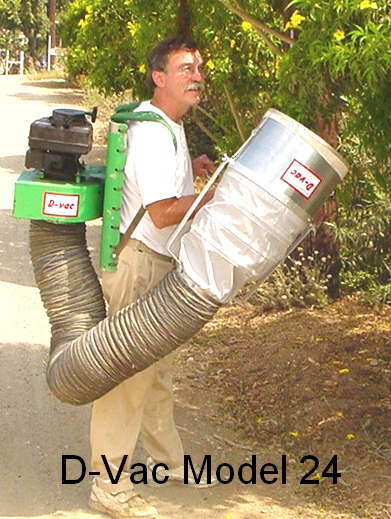 Model 24 that has a larger motor fan on a backpack connected to the collecting head by a hose. Model 122 that has the collecting head attached directly to a smaller motor fan that is carried by hand. Both are powered by gasoline engines for complete freedom in the field. Insects are collected live in organdy bags and may be studied in the field or taken to the laboratory for separation. The back-pack collector Model 24 is the most useful for heavy-duty sampling where large numbers of samples or long continuous samples are to be taken. It can be used with the Screened Ground Sampling Cylinder DV302 for "square foot" ground samples and with the 4 in. Adapter Hose DV306 for more concentrated suction. The hand-carried Model 122 is useful because of its simplicity and compact design. With no hose friction, this unit has maximum air flow for its weight. However, the total weight of the unit is sustained by the arms and hands. This model was designed primarily for taking quick samples for field checking, being compact enough for easy transport in an automobile trunk. The advantage of D-VAC vacuum sampling is the more complete extraction of the tiny species and the immature forms of even the larger insects. Conventional sweep nets build up a pressure and insects of low body mass simply do not enter these nets as they are caught in the overflow of air pressure built up as the net is sent through the air. By applying suction to the collecting bag, this inertia of air at the entrance of the net is overcome and the tiny forms are collected more readily. Using a similar approach to the plant as is done with the swinging of an insect net, the D-VAC can also sample the heavier caterpillars, etc. This is the advantage of using a sweeping motion rather than relying only on the vacuum capability. This machine is not a high vacuum, but more a mover of air in large volume. The cones can concentrate the air flow at the entrance of the net and thus increase the collection capability. It is advisable to approach the plant as quickly as possible to surprise and thereby catch a larger proportion of the quick flying species and the ones that tend to drop or to hold on vigorously if they are warned of the approach of the collector. The D-VAC sampling method is very useful in pest management programs to assess the balance of predators and parasites as well as pests. There have been references in entomological literature to the use of the D-VAC collectors in scientific experiments by university and United States Department of Agriculture scientists. They have been used in 50 states in the United States and more than 52 countries. 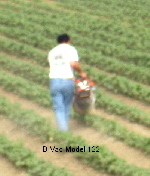 The hand-carried Model 122 is useful for taking quick samples for field checking because of its compact design. It has an Echo air-cooled 2-cycle, 1 horsepower motor and Revcor fan. The standard D-VAC collection unit has a square foot opening and protective collar and comes with a collecting cone, 4 nylon organdy collecting bags and a medium mesh screen sieve bag for separating samples by size. It runs on gasoline mixed with oil. It weights approximately 23 lb. (10.5 kg). The airstream is can reach approximately 280 cu. ft./min. The advantage of the D-Vac vacuum sampling is the more complete extraction of tiny species and immature forms of even the larger insects. 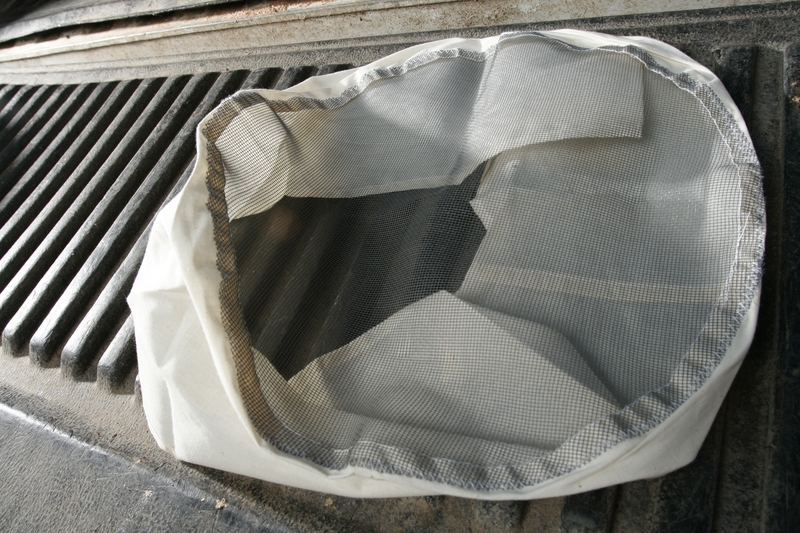 Insects of low body mass simply do not enter conventional sweep nets that build up an overflow of air pressure as the net is sent through the air. Approach the plant as quickly as possible using a swinging motion to surprise and thereby catch a larger proportion of the quick flying species and the ones that tend to drop or to hold on vigorously if they are warned of the approach of the collector net. This method is very useful for assessing the balance of predators and parasites as well as pests. The D-VAC Model 24 is a vacuum insect collector powered by a Briggs & Stratton 3.75 H.P. engine. The motor and fan are mounted on a back-pack carrier. The fan is a Revcor squirrel-cage blower with forward curved blades. A 6-foot 8-inch length of 8-inch diameter flexible air duct connects from the bottom of the fan to the collecting unit. A 13-inch diameter collecting cylinder is attached by a coated-fabric sleeve to the flexible air duct. A nylon organdy bag fits inside the collecting cylinder and is held in place by a protective collar. Four organdy bags with muslin cuff, one screen sieve bag and one collecting cone (No. 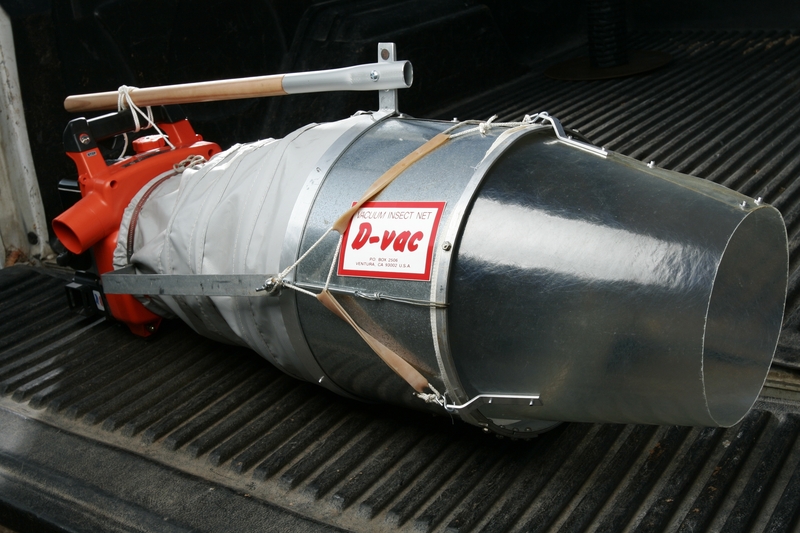 304 cone with 1/3 square foot opening) are included with each D-VAC collector. WARRANTY: The engine is warranted by the Briggs & Stratton Corp. The collection unit is of lightweight materials guaranteed against defective workmanship for 90 days by D-VAC Co. TYPE OF FUEL USED: Regular unleaded gasoline. See manual for fuel and oil recommendations. For D-Vac Model 24, the previous engine was a 2-cycle that required special oil to be added to the gasoline. Tecumseh Engine Company no longer makes that engine. It was necessary to adapt a new engine to power the motor fan. A Briggs and Stratton engine was found that most closely meets the needs of this insect sampling equipment. The Briggs and Stratton engine is not a 2-cycle engine. Oil is not mixed with gasoline. There are separate places where oil and gasoline are added. The engine is shipped without oil or gasoline. Please read the instructions for oil and fuel recommendations in the engine manual! The D-Vac insect net is not authorized for use of this engine by the Briggs and Stratton Corporation. However, Fan Equipment Company of Las Vegas, NV assembles these motor-fan power systems. They have adapted this engine to fit the needs of D-Vac Company. See safety precautions in manual form No. Ms-3839-7/98. In particular ear protection is advised for prolonged use. Keep this engine in an upright position when storing or in transport. Do not transport engine with fuel in the tank or with fuel shut-off valve open. Although the manual does not refer to this as a problem---it is probably a good idea to keep the engine upright at all times so the oil remains in the bottom of the oil pan and does not contact the rings of the piston. See about storage over 30 days in the manual. Drain fuel to prevent gum from forming in fuel system or carburetor parts. Store in an upright position as when checking the oil level!